As siding contractors servicing Lexington, KY we provide siding repair and new installations for aluminum and vinyl siding. Vinyl Siding As Low As $99/mo! Brad and his staff are superb with the people they hire, the products they offer, and the quality of the workmanship. There are many different vinyl siding stores around Lexington, but they only promote and install their own brand. However, with Lexington Blue, we have access to all brands of siding and this allows us to find the best product for your home that fits your style as well as your budget. Discover which type of siding may be right for your home in Lexington. Coming in as the most common type is vinyl siding. It’s an affordable, yet durable type of siding that you can install on your home that requires little to no maintenance. Seamless steel siding provides a more unique look and offers a greater resistance against mother nature when compared to vinyl. Just because it’s steel doesn’t mean you can’t have a look you prefer. It’s also made to resemble wood. If you’re after the most natural look possible, wood siding will achieve just that for your home. While maintenance such as cleaning and staining are recommended, it’s a popular choice that can give your home a terrific curb appeal. Many of our clients ask…What’s the best color of siding to compliment my home? We often find that preferences vary on this, but we recommend the following popular color choices for siding. A fail safe solution that compliments almost any home’s exterior is white colored siding. It blends well with most dark and all light colored shingles. It also provides a good foundation to work off of for different shades of shutter selections. Here is an image of our white siding. 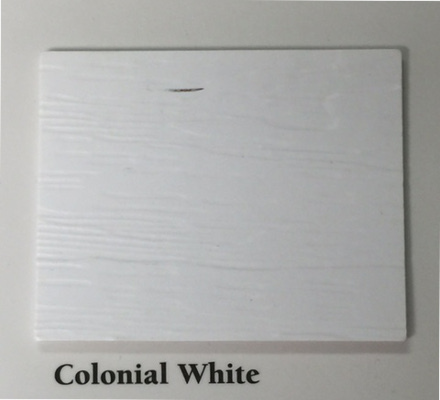 It’s called “Colonial White” in our inventory. Grays and Tans are some of the most popular siding colors. These earth tones provide the perfect contrast that really add definition to every color on your home. They give you the versatility to compliment any shingle color and help keep your home from looking as dirty as it might really be. 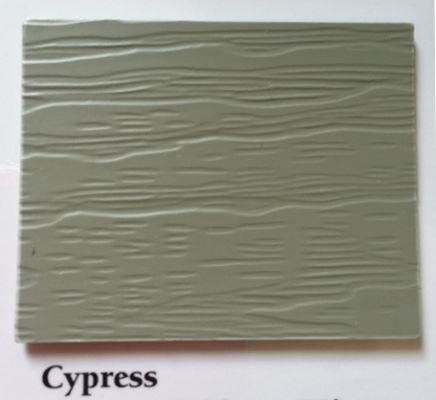 Here’s an image of tan siding, which we define as “Cypress” in our product offerings. Here’s an image of gray siding that we offer. 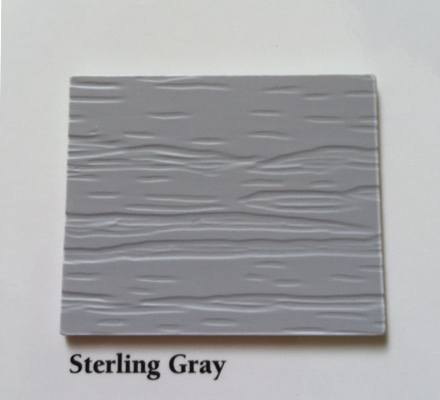 This product is labeled in our inventory as “Sterling Gray”. With a more dominant color choice you’ll have to really consider how it’s going to match and coincide with your existing color structure. If done correctly, it adds a great look to any home. 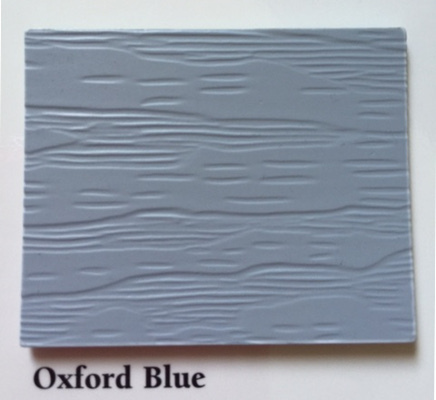 Here is an image of blue siding, referred to us as “Oxford Blue”. We have a variety of blue colors to choose from, but this tends to be the most popular choice. For you UK Wildcat fans, we can really boast your loyalty by adding any one of our blue siding colors to your home! Ask anyone of our clients and you’ll likely here them say they consider us as distinguished experts for our vinyl siding services in Lexington. We pride ourselves on superb craftsmanship and delivering our installs with attention to detail. It’s the respect we give your home delivered with the quality you deserve! Here’s what you can expect with us. We don’t just tell you what you need. We listen, visualize and offer unbiased options that are the right solution for your home. Each home deserves it’s own appeal and yours is no exception. When you’re trying to decide on what type is the right choice, you can count on our knowledge to help you make the best selection. Each type of siding comes with it’s own advantages and disadvantages. We’ll help you understand each of these to prevent down the road uncertainties. When it comes to matching the existing fascia, vinyl and aluminum siding on your home, we have the experience in identifying and matching all of our local products. Whether it’s from storm, hail or wind damage, our expertise is matching your existing color. No matter what type you select, our siding crew has the expertise to do it right. While other siding companies can easily hide their mistakes, we make sure to not overlook even the smallest of details to ensure your project lasts. If you’re considering which type of siding you should add to your home, we recommend vinyl. It’s extremely versatile and compared to the costs associated with other types, it’s usually a winning choice. Vinyl siding can eliminate required maintenance and add to the value of your home. It offers a no paint, no stain and no hassle solution that homeowners love. Based on the average size home, repainting or staining wood siding can cost as much as $6,000-$8,000 every 4 years. A premium vinyl with a classic authentic look of wood can enhance the exterior of your most valuable asset and limit these expenses. With only occasional cleaning required, we find that most homeowners prefer vinyl siding for their home’s exterior. Exterior vinyl products come in a wide variety of sizes, shapes, textures and last but not least colors. The labor required for installations is all pretty much similar, but the industry has many different quality products available. Contractor panels such as Alside and Georgia – Pacific are available with a minimum thickness, a shallow projection, a minimal color pallet and as little as a 20 year warranty. At the other end of the quality spectrum; exterior siding will be thicker, have a larger projection, thus giving a more realistic look of painted wood and have a larger selection of textures and colors. Top quality manufactures such as Mastic, Crane, CertainTeed and Norandex will also carry lifetime transferable warranties. The exterior manufacturing industry allows most home owners to choose a look, style and color that can fit into their remodeling budget. We will offer any type of quality siding product for you to choose from. Each have their own set of parameters to consider such as cost, life span and durability. No matter which one you select, we will install it with precision and correct components to ensure it lasts. When quality matters for your home, you can trust us as one of the best siding companies in Lexington! Our siding installers perform each of our installations to not only adhere to the manufacturer’s warranty requirements, but also with a dedication to quality. You’ll receive a superior experience with our open lines of communication that exceed your expectations. If your home is in need of siding repair, storm damage replacement or you’re just wanting to give it a makeover, trust Lexington Blue for the job!